Samaaradhanai is usually conducted in the family before a major function like Marriage, Upanayanam etc; Also whenever elders in the family comes back after visiting Kasi performing the rituals there it is a practice that Samaaradhanai and ganga pooja are performed. This is to ensure that there are no hindrances that occur while conducting the functions. Also, a thanks giving for god who facilitated us to complete the yatra without any obstruction. Few families do the Samaaradhanai to Venkatachalapathy and few to Lord Muruga. Usually it is performed to the family deity/Kula deivam. Most families have the practice of performing Samaaradhanai to Lord Venkatachalapathy on (Tamil Month) Purattasi Saturday. Maavilakku is also offered on the day if that is a practice followed in their families. My mom recently visited Kaasi and performed the rituals there with atmost sincerity. Hence we performed Samaaradhanai at our home. 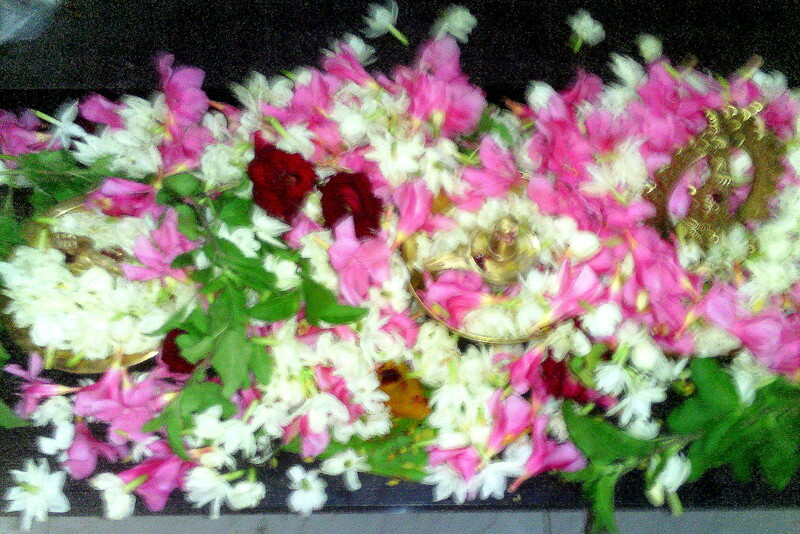 Usually, Pandit will come and perform the Pooja. Minimum 2 Brahmins are required to offer Lunch after completing the Pooja. Depending on the financial strength of the family conducting the function, the Brahmins are offered with dhoti and Angavasthram. The day when we conduct the Pooja should also be an auspicious day. Ensure it does not fall on Ashtami/Navami/Kari Naal. While conducting Samaaradhanai for Lord Venkatachalapathy elders prefer Saturday. Pandits also chant Sahasranamam on the day. 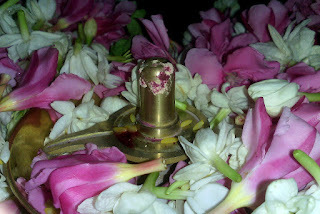 The items required for Pooja includes, Flowers for Archanai, garlands for god, Betal Leaves & Betal Nuts, Coconut, Banana, Sandal, Kumkum, Turmeric powder, Camphor, Agarpathi, Brass Cups, Pancha pathiram, Brass Plates, Manai Palagai for the Pandit. Clean the Pooja room and Vilakku (Preferably two), apply sandal and kumkum and keep it ready the previous day itself. Draw Kolam in the Pooja room and at the entrance of the home in the morning. 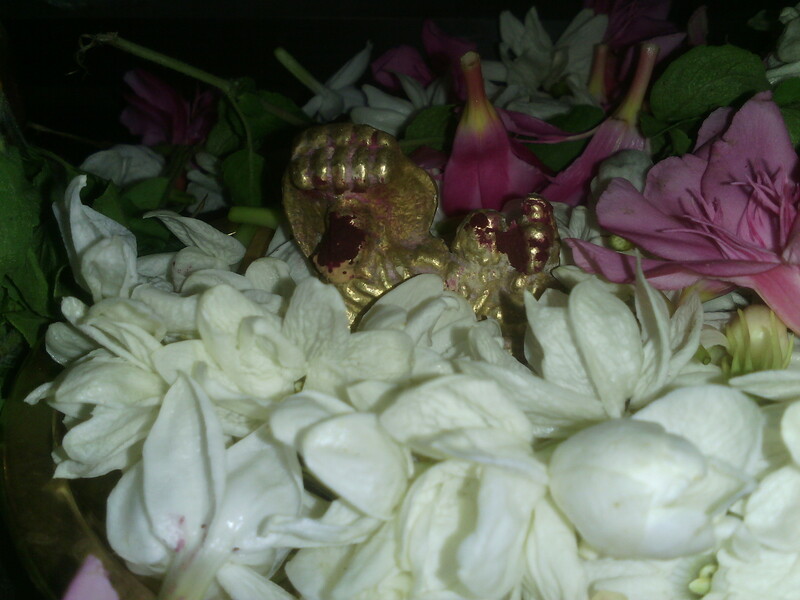 Place a Manai palagai in the Pooja room and place the idol of the god. Archanai is made for the idol/photo of the god. Madi dresses are required for the persons who perform the Pooja and for the one who is involved in the preparation of the food including Neivedhyam. Married Ladies wear Madisaar and gents wear Panchakacham. Usually Sakkarai Pongal and Ulundu Vadai are prepared for Neivedhyam. The lunch is also prepared specially for to offer for the Brahmins who are invited. Close family relatives are also invited to attend the Pooja. The menu for the day includes, Sakkarai Pongal, Thayir Pachadi, Sweet Pachadi, Two curry varieties, Aviyal, Green chutney, Pickle, Vadai, Two variety rice, Fruits, Pitlai, Rasam, curd. Banana leaves are used to serve food. No onion No garlic recipes only are allowed on this day. Pandit performs the Pooja, chant sahasranamam and then give sometime for us to submit our prayers to god. We have to perform Namaskaram to god and get the blessings. Then offer the dhakshanai and food to the Brahmanas. After the food is consumed by them, we have to perform namaskaram to them as well. They will offer their blessings to us. Persons who do the Pooja and prepare food do not consume breakfast in the morning. Food is consumed after the completion of Pooja. Kids are usually allowed to take some light food. Share your experiences and practices in your family related to Samaaradhanai.